Migration season is always a birder’s paradise as species that aren’t usually found in Iowa can be seen passing through. August through October are typically peak migration months. Warblers are one such group of birds that are fun to watch. During fall migration many warblers have their winter coats instead of their bright breeding plumage which can make it an extra challenge to identify the different species. Though they sing less because they aren’t searching for a mate, listening for their short vocalizations is still one of the best ways to help identify warblers. This is especially useful if you want to identify the species as they migrate during the night. Most warblers migrate, or at least start their migration, during the night. They will “drop-out” during the day and use that time to refuel for the next flight. In addition to the 10 species of warblers that breed in Iowa, there are also 16 that pass through Iowa during migration. 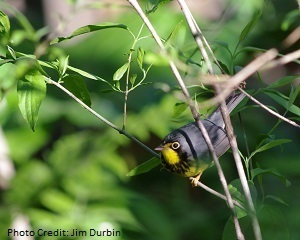 Two of these species—the bay breasted warbler and the Canada Warbler—are Species of Greatest Conservation Need (SGCN) meaning these species have a low or declining population. The Canada warbler (Cardellina canadensis) nests in the northern United States and in Canada and spends winter in northwestern South America. It is one of the earlier migrants and may spend only two months at its breeding location. Unlike many warbler species, the Canada warbler does not have a noticeable difference in its breeding and non-breeding plumage. It is sometimes called the “necklace warbler” because of the band of dark streaks across its chest. Both sexes have the necklace, although the male’s may be slightly darker and more conspicuous. The chest, throat, and belly are yellow and the back is grey. They also have white eyerings or spectacles. 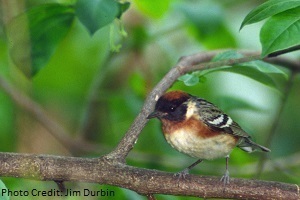 The bay breasted warbler (Setophaga castanea) breeds in the northern United States and Canada and spends winter in northwestern South America. It is one of the later migratory species and may linger quite late into fall. In summer, the male is known for having a blackface, chestnut head, and reddish-brown on the flanks. The female has a more muted version of the male’s plumage. During the fall migration, the bird is in its non-breeding plumage and becomes a greenish “confusing fall warbler.” In order to identify it look for light streaking on the back, thick wing bars, dark colored legs and feet and the reddish wash that some birds keep from breeding season. So, if you’re looking for a challenge this fall, grab your binoculars and head out for some warbler watching. Iowa Department of Natural Resources. Manage your subscription preferences, unsubscribe, or get further help.